Hey guys! First post here! I just picked up a g2c 9mm about 2 weeks ago. I got it at my local gun store because they actually price matched rural Kings 179.99! With the Taurus rebate, I couldn't pass it up! It's also my first handgun! I've already put about 300 rounds through it and couldn't be happier with it! Absolutely love everything about it so far! Granted, I have nothing to compare it to, but I still love it! At this point, I really only have one question. I've searched and read on here but can't really find an exact answer. Since I'm just the kind of guy that modifies everything I own, I'm very interested in the lakeline parts. My question is, what exactly is the steel guiderod suppose to do? I have no problem spending the little money on it simply to have a stainless part, but I'd like to know if it's suppose to actually change the way the gun functions at all. Or is simply just to reply the polymer part with a stainless part? I appreciate any and all feedback! Thanks so much! 777Driver, loudviking, silverstring and 6 others like this. I have the Lakeline rod and springs in my early PT111G2 and it is now over 5000 rounds through it and running very well. Shoot your pistol for now and latter just for grins get a Lakeline rod, they have a lot of great parts for the 111G2! Welcome to our forum. Ditto to what loudviking said above, the Lakeline is just a better made guide rod asm, however the poly rod from Taurus has a pretty good track record. I have two reviews on that little pistol you may wish to review. I own two older G2's, and one new G2C. They are essentially the same gun except that the G2C does not have the Taurus Safety Keylock. That, and the imprint along the slide rail are different. The G2 says PT-111 G2 on the rail, and the G2C doesn't mention PT-111 at all except on the bottom, in front of the rail, next to the serial number. One weak point of this gun is poor quality control on the part of Taurus. This is a good gun, but a very small percentage of lemons seem to get through the system and are sold to the public. I estimate 5 percent based on the complaints on this forum. The recoil spring is a weak point on the gun itself. I had one fail on me, and at first it wasn't obvious that it was broken. Check out the photo I attached. 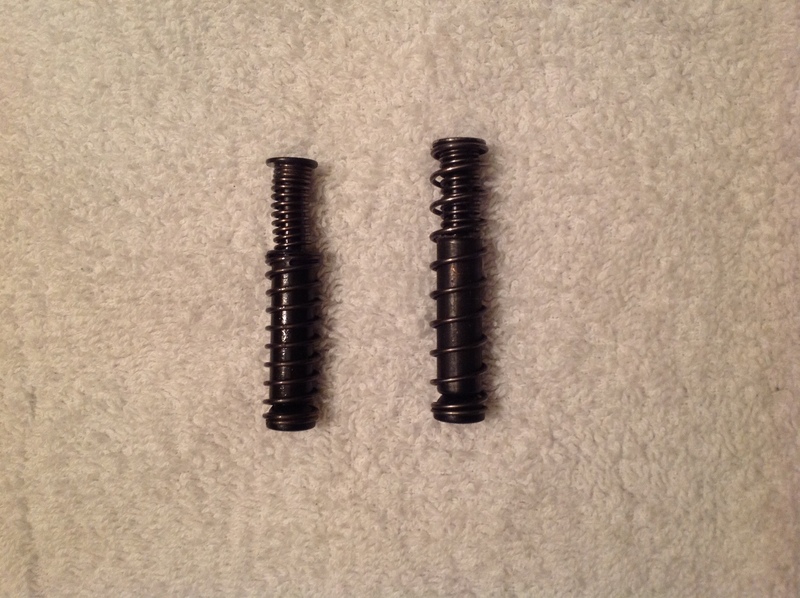 On the left is a normal recoil spring; on the right the sleeve that holds the outer spring has broken, and the outer spring has extended full length. This spring will not work properly because the slide won't seat all the way forward. I called Taurus, and they were very quick to send me a new recoil spring in the mail in less than a week. Another peculiarity of the G2/G2C is a “click” in the trigger. You may have noticed it as you pull the trigger back, but before it releases. I think this is caused by the Trigger-blade safety not getting completely out of the way, and rubbing against something as you pull the trigger back. This click is more pronounced in some guns than others. My first G2 had a very distinctive click, but my second G2 had no click at all. I was hoping that Taurus would have fixed this problem, but my new G2C has the click too. I fixed the clicking problem by tying back the trigger-blade safety with a zip-tie, and then heating the trigger with a hair dryer. I let it set for a week with the zip-tie on it, and then I removed the zip-tie. Now the triggers on both of these guns work beautifully. I did get a Lakeline stainless steel recoil spring, and I put it on whichever of these guns that I carry. At the range I use the Taurus springs, but I want a little more reliability on the gun that I carry. In my opinion this is a very good gun,especially for the price. If it had a decocker it would be perfect! Last edited by 777Driver; 04-07-2019 at 03:31 PM. Thank you all so much! I do love his gun so much! Again, I don't have anything to compare it to, but who cares! I assumed the guide rod was just to replace a plastic part, but just wanted to make sure! Awesome! If I keep up shooting it as much as I have the past 2 weekends, I'll replace that guide rod sooner than later! Honestly, the only issue I had with the gun was 2 failure to fires, but those were both with Winchester forged. After I got rid of those, I haven't had the tiniest problem at all! As to the clicking in the trigger, because I haven't fired any other handguns before, I just assume every sound it makes it totally normal, so I can't tell you for sure if it actually clicks on the spot or not! I'm going to continue shooting the crap out of this little guy and getting better as a shooter! taurustoter, 777Driver and loudviking like this. I am a sporting goods associate at a Walmart. If you ask for any steel ammo, I make sure that you are aware that ti is steel cased. If you are, I'm happy to sell you all you want to buy. If you aren't aware or haven't run it through your gun before, I'll suggest purchasing different ammo--unless you want to try a box to see if your gun likes it. Welcome to the forum OP! Happy to hear your new pistol is running good for you. I tend to stay away from steel-cased ammo, for my handguns anyways. I don't like the harder "military" style primers mainly, plus in 9mm, the cost savings over brass cased ammo is almost nothing. Welcome from South Texas. Some people buy the recoil assembly just as a spare, some just don't like the plastic. Greetings from Michigan, New G2C Owner. New owner of G2C first range report.